Peat-Free Pro-Grow Multi-Purpose Compost is a careful blend of ingredients designed to provide the perfect growing conditions for a wide range of plants at all ages. It contains plant nutrients as well as added fertilizer which will boost the health of your plants for 6 - 8 weeks. The structure of Pro-Grow Multi-Purpose Compost will encourage healthy root growth and.will retain soil moisture. It will also improve soil fertility, break down heavy clay soils, or add humus to sandy soils if used as an improver. 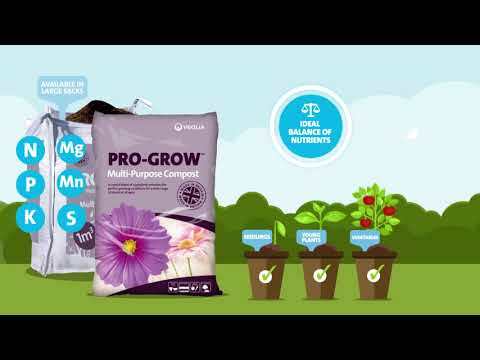 Pro-Grow Multi-Purpose Compost can be placed directly into hanging baskets, pots, containers, beds and borders. It can be used for development of rooted cuttings and young plants, re-potting, general soil improvement as well as growing vegetables and planting shrubs. Pre-order online with our Click and Collect option and collect your order from one of our sites where this option is available. When you place your order you will be given a unique order number which you must bring with you, along with a form of valid ID, when you collect. Please place your order before 1pm Monday - Friday so that we can get them ready for you to collect the following day. Place your order before 1pm on Friday if you want to collect on a weekend. Orders placed on the weekend will not be ready for collection until the following Tuesday. Please be aware that local retail sites may offer discounts and promotions which are not available online. Order online and get Pro-Grow delivered to your home. 10L Multi-Purpose Compost bags are delivered within 5 - 7 working days. In order to give you the best possible value for money, orders of any more than 10 bags may be delivered on a pallet. Pallets are delivered on a 7.5t vehicle and unloaded using a pallet trolley. If you order more than 5 bags then you will need good access for a 7.5t vehicle and please be aware that the pallet trolley cannot travel across un-even surfaces (e.g. gravel). We will try our best to put the pallet where you need it but WE MAY ONLY BE ABLE TO DELIVER IT TO THE KERBSIDE. "Pro Gro is a great and eco friendly product.It is currently rejuvenating a new garden for me."